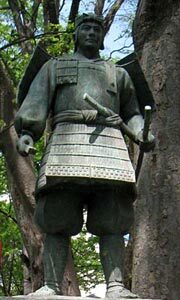 Minamoto-no-Yoshiie (1039-1106) represented the glorious part of the Minamoto clan's history. Black letters are the old province names. Blue letters are the present major cities. The yellow square shows the place of Ookunitama-Jinja. 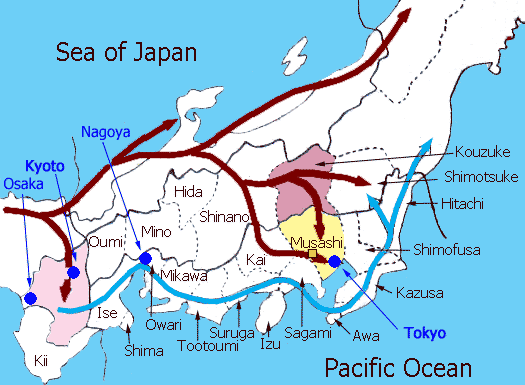 The brown line shows the migration route of the Izumo clan and the related people. The light blue line shows the marching route of the Yamato clan. The partial reconstruction of the provincial government building east to Ookunitama-Jinja. 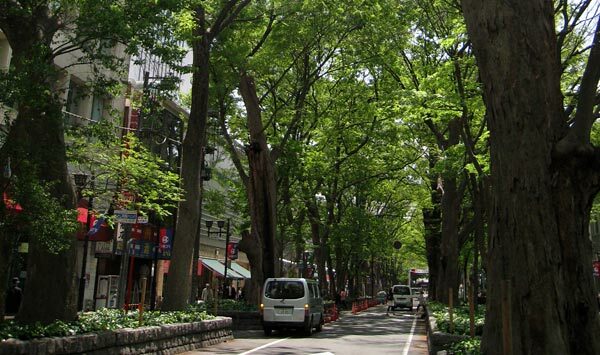 Leaving the train at Fuchu Station, we can immediately find an avenue with huge keyaki trees. This is the entrance path to Ookunitama-Jinja. 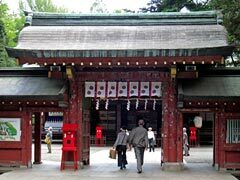 According to the oral tradition of the shrine, it was established in 111 and enshrines Ookunitama-no-Ookami. When a reform government was established in 645, the area beside the shrine became the seat of the government of Musashi Province, which covered the most part of the today's Tokyo and Saitama prefectures and the northern part of Kanagawa prefecture. Governors of the province tried to save time to visit the important shrines located in different places of the province and established 6 small shrines in the court of Ookunitama-Jinja as branch offices of the main shrines. Afterwards, Ookunitama-Jinja became an important sacred place in Musashi Province. It is interesting to make certain considerations about the enshrined deities. Many of them are related to the founders of the Imperial family, who descended from "Takamagahara" (the High Plain of Heaven), became the ruler of Japan and were known as the Yamato clan. However, when we see the old shrines in Kanto Region, many of their deities have different origins; they were the gods of the Izumo clan, Azumi and other ocean tribes and the immigrants from Shilla, the South-Eastern part of Korea which later became a kingdom ruling the whole Korean peninsula. Ookunitama is one of the many names of Ookuninusi, who had his power center in Izumo - present Tottori province, where Ookuninusi has a huge shrine - and once the ruler of Japan. However, according to myths, he gave up his country to a god dispatched by the Sun Goddess Amaterasu. This means that Ookunitama was a deity of the Izumo clan who was defeated by the Yamato clan led by the ancestors of the Imperial family. Haiden on the right side is for the worshipers. Honden, which can be only partly seen on this photo, is for the gods to place themselves for a while. Wooden structure of the roof part of a gate. When we want to find old information about shrines, their own traditions are usually not much reliable, as they are in most cases not based on original written materials. Fortunately, we have Engi-shiki made in 927, detailed regulations for the enforcement of laws. There were many in the ancient time. But, Engi-shiki is the only one preserved till now and there is a list of the officially registered shrines, 2861 in total. Among them the number of shrines in Musashi Province is 44. Of course, the number of shrines was big in the power center, present Kansai region. The number of the Musashi Province is rather big taking into consideration of its remoteness from the central region. 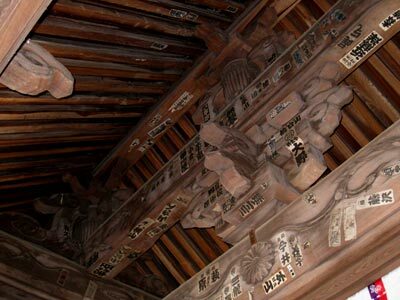 Among these 44, the shrines dedicated to the Izumo related gods are 20 and represent 45.46%, which is remarkably bigger than the other provinces in Kanto region, except for Kouzuke, present Gunma prefecture, where the correspondent percentage is 63.63%. 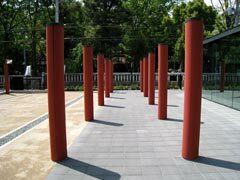 The most important shrine in Musashi Province is Hikawa-Jinja in Omiya(*), in the present Saitama prefecture. Hikawa-Jinja enshrines Ookuninushi's father Susanoo, who is the younger brother of the sun goddess Amaterasu according to the genealogy of the Japanese myths described in the old history books Kojiki (712) and Nihon-shoki (720). As far as the origines of those gods are concerned, some influential scholars say that Ookuninusi was the main deity of Izumo clan and Susanoo was the god of Shilla tribe coming from Korea in the ancient time. Together with other people they migrated northward along the coast of Sea of Japan, and then some of them went into mountainous area and reached Kouzuke and from there the adjacent provinces. Another group took a slightly southern course and reached Musashi. They most possibly mixed with the local Jomon people(**) and established the regional political entities around the birth of Christ. Omiya was the largest city of the prefecture, but now merged with Urawa and is called Saitama. The meaning of Omiya is "big shrine" and refers to this Hikawa-Jinja. Jomon people started to live in Japan around 12,000 BC. Though they were essentially hunter-gatherer, they produced oldest potteries in the world and started a sort of fruit growing and other types of agriculture. The new immigrants - here Izumo clan and others - brought among others rice cultivation using paddy field system. We have no written materials, but the archeological evidences and the existence of ancient institutions such as old shrines can give us some possibility to look into the history in Kanto region before the written history. Yamato government started to enlarge its influence in the eastern Japan after the 4th century. It followed the route along the coast line of the Pacific Ocean. The southern part of Musashi fell into the hands of Yamato by the beginning of the 6th century and the stronghold of the Izumo clans in Kouzuke surrendered to Yamato probably in the mid 6th century. Gate for the front court of Haiden. Ookunitama-Jinja was not referred to by Engi-shiki. The shrine's own records have been most probably destroyed during the course of time. Therefore, the first reliable reference to it was as late as in Azuma-kagami, the official chronicle of the Kamakura Shogunate compiled around 1300. 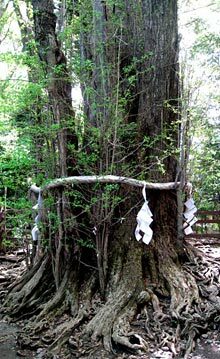 According to the tradition of the Ookunitama-Jinja, the keyaki trees were first donated by a samurai leader, Minamoto-no-Yoriyoshi and his son Yoshitomo on their expedition to North-East (1051-62). While the oldest keyaki tree is now only 600 years old, the gingko tree behind the main building of the shrine is as old as to have seen the father and son of the Minamoto clan.